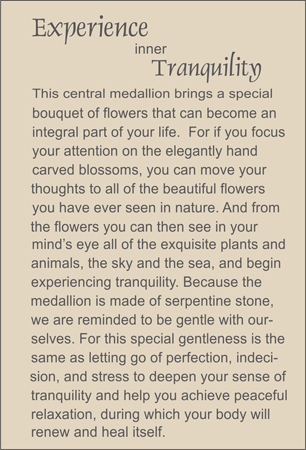 MEDALLION: Taupe-colored serpentine hand carved medallion representing a flowering plant with blossoms in a Chinese vase with handles. COMMENTS: Flowering plants never harbor stress and anxiety, use this bead to let go of your inner tension. See other styles related to relaxation by scrolling down.